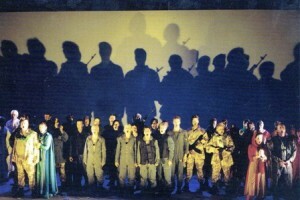 The commission for the translation came from Mid Wales Opera for their autumn tour in 1997. Their production, directed by Stephen Medcalf and conducted by Keith Darlington, was intimate and affecting in the Teatr Hafen in Newtown. The chorus in the last act was underneath the audience seating, which created a startling effect. you are the star that pervades my sight. raise you a throne, me by your side.